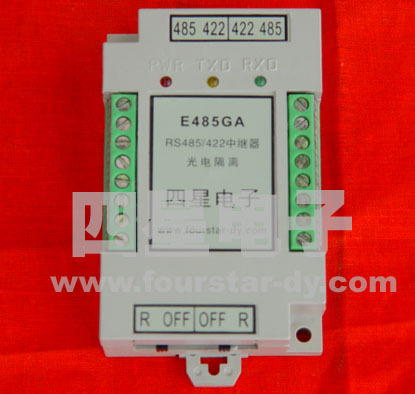 E485GA light-isolated repeater is used to achieve the isolation and relay to enlargement of RS485 and RS422 signals. When RS485/422 communication distance is longer than 1.2 km, this repeater is required in order to realize signal amplification and extend communication distance. The products have characteristics such as high-speed, two-way extending, automatically switching the flow of signals and automatically adaptation of baud rate. All their industrial-grade devices are anti-static and anti-lightning, make them work stably in the poor industrial environment. Notes: The anode and cathode can’t be connected wrong, or the product will be damaged. 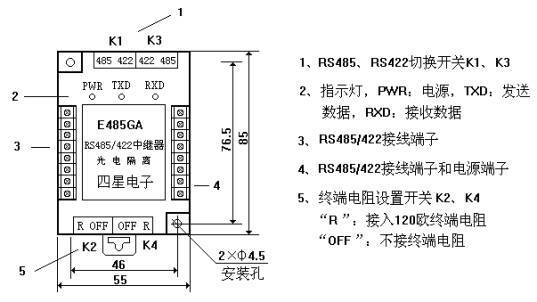 Turn the RS485, RS422 switch K1 and K3 on E485GA to "485" position, the terminal resistance setting switch K2 and K4 to "R" (connect in 120 EU terminal resistances). Connect wires as the following map can extend 2 km of the communication distance in two ways. The 120 Ω resistances in the picture is terminal resistance. They are to prevent the signal reflection in the line. 1 K resistance is the pull resistance. Its role is to ensure the line is logic "1" when the line is in leisure so that the data bits in cease - to prevent the reception error. Users must connect in above resistance in the line’s terminal as the map shown. Except for the signal relay, E485GA can also be used as RS485 isolator, the signal isolation rate is up to 500 Kbps, better than other similar products. Turn the RS485, RS422 switch K1 and K3 on E485GA to "422" position, the terminal resistance setting switch K2 and K4 to "R" (connect in 120 Ohm terminal Resistance).. Connect wires as the following map can extend 2 km of the communication distance in two ways and support full-duplex multi-machine communication. The 120 Ω resistances in the picture is terminal resistance. They are to prevent the signal reflection in the line. 1 K resistance is the pull resistance. Its role is to ensure the line is logic "1" when the line is in leisure so that the data bits in cease - to prevent the reception error. Users must connect above resistance in the line’s terminal as the map shown. Except for the signal relay, E485GA can also be used as RS422 isolator, the signal isolation rate is up to 500 Kbps, better than other similar products. 2, In order to prevent the common mode voltage of RS485/422 interface beyond the permitted range witch would impact the reliability of communication or even damage interfaces, you can use a low resistance wire whose cross-sectional area is 1 mm2 to connect the signal ground "SG" and the power ground "GND" of E485GA with the RS485/422 nodes’ signal ground on their respective side. 3， When use shielded twisted pair, please connect the shield to the "FG" terminal of E485GA, and to land finally. 4, For the setting of terminal resistance, the role of terminal resistance is to eliminate the waveform distortion caused by the reflection of signal in the communication lines. Please connect terminal resistance and pull resistance into the start and end of communication lines as the picture. And turn the termination resistor setting switch K2 and K4 of E485G to "R" (connect 120 Ohm terminal resistance). But the terminal resistance is not acceptable for other RS485/422 nodes in line. 5, when composing the four-wire full-duplex RS422 multi-machine communication network, each RS422 node must be DE control node. That is, data TXD +, TXD-should be the closed high-impedance state when not sending data.